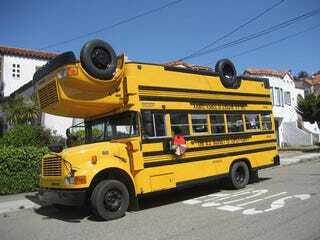 Introducing the Topsy-Turvy School Bus. This, um... unique vehicle is the work of Tom Kennedy and Haideen Anderson, who managed to weld together two school buses with the purpose of delivering a political message. One has to be batshit-crazy to want to weld two school buses together, right? Not necessarily. This project was commissioned by Ben Cohen, who is better known for being one half of the Ben & Jerry ice-cream-empire duo. Ben wanted to demonstrate how topsy-turvy the U.S. budget is, by...wait for it...creating a....topsy-turvy bus!